Sorcerer Radio's WDW Tiki Room is giving listeners a chance to win WIN a copy of "Remembering Roy E. Disney." A few weeks ago show host, Aljon had the privilege of interviewing author, Producer, Creative Director and Head of Special Projects at Walt Disney Animation Studios, David A. Bossert and Roy Patrick Disney, business investor and son of Roy E. Disney, great nephew of Walt Disney. The book is more scrapbook than biography, Remembering Roy E. Disney draws a poignant and funny picture of a man revered and idolized by legions of Disney fans and admired, cared about, and very well liked by all those that had the honor to know him; to be part of one of his inner circle of friends. Filled with personal memories, stories, and artifacts collected along the way, this book will contain written stories as well as drawings and candid photos. Perfect for Disney fans, film buffs, and animation historians. Listen for info on how YOU CAN WIN! Enter every day until this Friday 9/6/13! 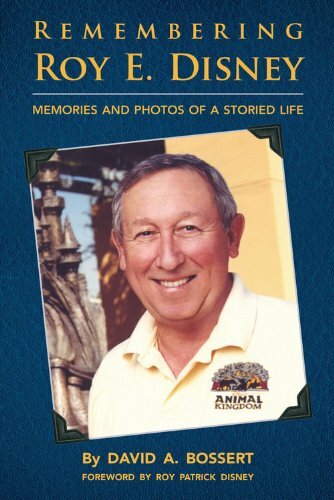 Order "Remembering Roy E. Disney: Memories and Photos of a Storied Life" Hardback Edition today!